What is pulmonary vein ablation? Pulmonary vein ablation (also called pulmonary vein antrum isolation or PVAI), is a treatment for atrial fibrillation. Atrial fibrillation is an abnormal heart rhythm that originates in the top chambers of the heart (atria). The goals of treatment for atrial fibrillation include regaining a normal heart rhythm (sinus rhythm), controlling the heart rate, reducing symptoms, and reducing the risk of blood clots and stroke. Many options are available to treat atrial fibrillation, including lifestyle changes, medications, catheter-based procedures and surgery. When is pulmonary vein ablation appropriate? Research has shown that atrial fibrillation usually begins in the pulmonary veins or at their attachment to the left atrium. There are four major pulmonary veins and all may be involved in triggering atrial fibrillation. 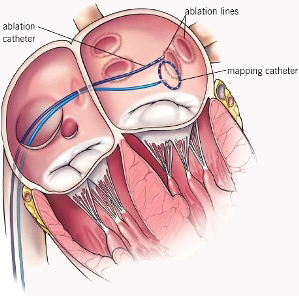 What happens during the ablation procedure? During pulmonary vein ablation, a doctor inserts catheters (long, flexible tubes) into the blood vessels of the leg, and sometimes the neck, and guides the catheters into the atrium. Energy is delivered through the tip of the catheter to tissue that is targeted for ablation. The energy is applied around the connections of the pulmonary veins to the left atrium. Frequently, other areas involved in triggering or maintaining atrial fibrillation are also targeted. Small circular scars eventually form and prevent the abnormal signals that cause atrial fibrillation from reaching the rest of the atrium. However, the scars created during this procedure may take from 2 to 3 months to form. Once the scars form, they block any impulses firing from within the pulmonary veins, thereby electrically “disconnecting” them or “isolating” them from the heart. This allows the SA node to once again direct the heart rhythm and a normal sinus rhythm is restored. Because it takes several weeks for the lesions to heal and form scars, it is common to experience atrial fibrillation early during the recovery period. Rarely, atrial fibrillation may be worse for a few weeks after the procedure and may be related to inflammation where the lesions were created. In most patients, these episodes subside within 1 to 3 months. Pulmonary vein isolation is performed by taking a catheter around the veins and burning the tissue in the atrium to block that electrical activity. How else can the procedure be done. In general, we use a stepwise approach. For those with normal hearts and limited fibrillation, we try to limit the initial procedure to a simple vein isolation. For those with more severe disease (larger heart or long term fibrillation), we favor long lines with wide circles or with a hybrid ablation. The hybrid ablation involves working with a cardiac surgeon who makes burns on the outside of the heart and with an electrophysiologist who then burns on the inside of the heart. The pulmonary vein ablation procedure takes place in the Electrophysiology (EP) Lab with X-ray equipment and several monitors. Your doctor will discuss the specific risks and potential benefits of the pulmonary vein ablation procedure with you. The procedure is generally very safe. However, as with any invasive procedure, there are risks that we track very carefully. These risks are explained below. Damage to the esophagus: The risk of damage to the esophagus is difficult to predict because it is very rare, but happens in approximately 1 in 400 patients. The risk of dying from a complication is about 0.1 percent. There have been isolated reports of bloating and abdominal distension after the procedure. This may be related to injury to nerves that control the contraction of the stomach muscles. It tends to resolve slowly. Other uncommon risks, associated with any X-ray procedure, include an allergic reaction to medication or contrast material and skin injury caused by exposure to X-rays. There may be other possible risks. When you meet with your doctor, please ask questions to make sure you understand why the procedure is recommended and all of the potential risks. Physicians take special precautions to avoid all complications, but risks cannot be entirely eliminated. We are equipped and prepared to quickly intervene if a complication occurs. You should weigh the risks of the procedure with the risks of having atrial fibrillation (which includes spontaneous strokes) and the severity of your symptoms. Also, please discuss any concerns you may have about lying flat on your back for a prolonged period (3 to 6 hours) during the procedure. What Monitors are used during the procedure? Several monitors will be used during the procedure to check your heart rhythm and your body’s responses to any arrhythmias that occur. Often before the ablation a transesophageal echocardiogram is performed. This allows us to see your heart, make sure there are no blood clots there and confirm that you do not have severe valve disease that will require valve surgery. + Defibrillator/pacemaker/cardioverter: Attached via wires to one sticky patch placed on the center of your back and one on your chest. This device allows the doctor and nurse to pace your heart rate if it is too slow, or deliver energy to your heart if the rate is too fast. Electrocardiogram or EKG: Attached to several sticky electrode patches placed on your chest. Provides a picture on the monitors of the electrical impulses traveling through the heart. + Blood pressure monitor: Connected to a blood pressure cuff on your arm. Checks your blood pressure throughout the procedure. + Mapping system: State-of-the-art technology that helps your doctor locate the exact area of your arrhythmia. + Ablation machine: Attached to another sticky patch on your back. + Oximeter monitor: Attached to a small clip placed on your finger. Checks the oxygen level of your blood. + Fluoroscopy: A large X-ray machine will be positioned above you to help the doctors see the leads on an X-ray screen during the procedure. + Intracardiac ultrasound: Performed by a catheter transducer inserted into the heart: Used throughout the procedure to view the structures of the heart and the catheter when it is in contact with the heart lining. Getting Ready: Before the procedure begins, a nurse will help you get ready. You will lie on a bed and the nurse will start an IV (intravenous line) in a vein in your arm. The IV is used to deliver medications and fluids during the procedure. A medication will be given through your IV to make you feel drowsy. Your neck, upper chest, arm and groin will be cleansed with an antiseptic solution. The catheter insertion site(s) will be shaved. Sterile drapes will be placed to cover you from your neck to your feet. What Happens During the Procedure: After you go to sleep the doctor numbs the catheter insertion sites by injecting a medication. The doctor inserts several catheters (long, flexible tubes) into large veins in both sides of your groin and sometimes in your neck. The catheters are advanced to the heart. Two of the catheters are guided into the left atrium through a small hole made with a needle and placed in the atrial septum (wall between the right and left atria). A transducer is inserted through one of the catheters so intracardiac ultrasound can be performed during the procedure. The ultrasound allows the doctor to view the structures of the heart and evaluate the position of the catheters during the procedure. A catheter in the left atrium is used to find or map the abnormal impulses coming from the pulmonary veins. Another catheter is used to deliver the radiofrequency energy outside and around the pulmonary veins. How Long the Procedure Lasts: The pulmonary vein ablation procedure may last from 2 to 6 hours. Each patient is different. Please let your family know that the preparation and recovery time take several hours, so they should plan to be at the hospital all day for your procedure. Discussing the Procedure Results: After the procedure, the doctor will discuss the results of the procedure with you and your family. Overnight Hospital Stay: You will be admitted to the hospital and stay overnight after the procedure for observation. Most patients are discharged from the hospital the following morning. In your hospital room, a telemetry monitor will be used to evaluate your heart rate and rhythm during your recovery. Telemetry consists of a small box connected by wires to your chest with sticky electrode patches. The box displays your heart rhythm on several monitors in the nursing unit. The doctor will remove the catheters and apply pressure to the insertion site to prevent bleeding. No stitches are needed. To reduce the risk of bleeding and bruising, a pressure dressing (bandage) will cover the catheter insertion sites in your leg and neck. You will need to stay in bed for 6 to 8 hours after the procedure. You’ll need to keep your legs still during this time to prevent bleeding. Symptoms/How You’ll Feel: You may feel general soreness, fatigue or chest discomfort during the first 48 hours after the procedure. Because it takes several weeks for the lesions to heal and form scars, it is common to experience abnormal or irregular heartbeats for 8 to 10 weeks after the procedure. Driving Home: For your safety, a responsible adult must drive you home. Activity: Usually you can return to your normal activities within 48 hours after the procedure. For one week after the procedure, you cannot lift anything that weighs more than 10 pounds. You should wait at least three weeks before you resume intense exercise. Medications: For at least 2-3 months after the procedure, you will need to take the an anticoagulant to prevent blood clots and reduce the risk of stroke. You may need to continue this medication for longer than 3 months, depending on your individual risk for stroke. You will likely need to take an antiarrhythmic medication to control abnormal heartbeats for 2 months after the procedure. Ask your doctor if you should keep taking the medications you took before you had the procedure. In some cases, your doctor may recommend additional treatments or medications to control abnormal heartbeats during the first 2 months after the procedure.